Call Lesley McKinnell a bubble: as Glinda the good witch, she floats right to the top. McKinnell, filling in for principal Natalie Daradich, literally dazzles as one half of the witchly team that headlines “Wicked,” Stephen Schwartz’s hummable 2003 musical that alighted in Madison Wednesday night. 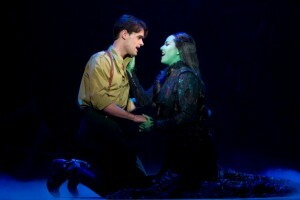 Chris Peluso and Vicki Noon play unlikely lovers Fiyero and Elphaba in the second national tour of Wicked, playing at Overture Center through Oct. 10, 2010. Glinda’s dress sparkles. Her tiara throws darts of light. Even McKinnell’s strong soprano is glittery yet grounded, never betraying that she doesn’t do this every night of the national tour. Wicked, running through Oct. 10 in Overture Hall, is all-over shiny, from polished dance numbers to Eugene Lee’s spinning, glowing set. It’s slick, and a little cold. Buy Wicked Overture Center Madison Tickets to the sparkling Cast in Madison WI. This entry was posted on Saturday, September 25th, 2010 at 7:34 pm	and is filed under Uncategorized. You can follow any responses to this entry through the RSS 2.0 feed. You can leave a response, or trackback from your own site.